Champion's 73536i 2000w Inverter Generators are the best choice when it comes to delivering power to sensitive equipment. The inverter generator delivers pure sine waves which are cleaner and more reliable than most generator power sources. 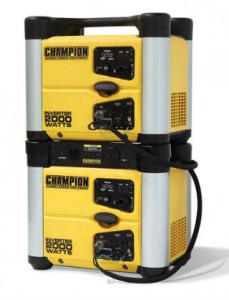 Champion's Inverter Generators are also lighter and quieter making them a great fit for RV owners. 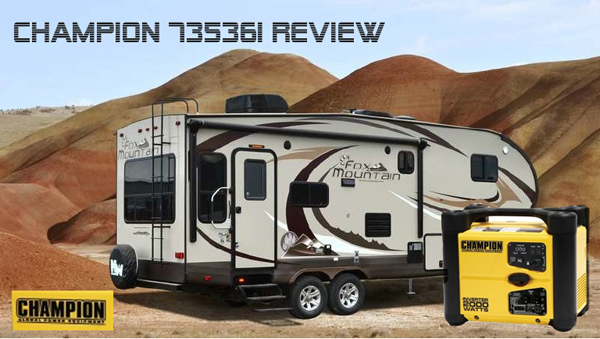 We tested the 2000w generator outside our RV and with the RV door closed we could not hear the generator at all. Surprisingly the 73536i generator ran our Coleman Mach III Power Saver 13,500 btu air-conditioner. As long as we first put the air-conditioner onto fan mode and waited about 30 seconds before switching to A/C mode, the generator ran the A/C with no problems. The 73536i generator delivers 2000 watts peak power and 1700 running watts. It weighs in at 48lbs and has the ability to be stacked. When two units are stacked together you will have 3000w of power available. An optional 73500i parallel power kit is available to fit between the two stacked units. This kit provides a 30 amp outlet for plugging in your RV cable. The 73536i has a 4 stroke engine with 80cc displacement and a Overhead Valve design. The engine runs reliably and has great heat dissipation allowing optimal fuel consumption. The 1 gallon fuel tank will allow approximately 9 hours run time at 1/4 load. This 2000w generator has a recoil start system which is very easy to use and the unit normally starts first or second pull. The decibel rating for the 73536i is a quiet 52 dBA at 1/4 load. The muffler contains a USFS approved spark arrestor. An easily detachable side panel provides oil change and spark plug access. The air filter and spark arrestor are accessed via a side cover after removing the panel screws. On the power panel can be found the on/off switch, economy mode switch, breaker, choke, fuel on/off switch, overload indicator, low oil indicator and output indicator. There are two 120v outlets and a circuit breaker. We have seen prices range from $499.00 to $699.00 on this generator. 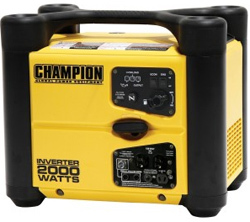 The Champion 75537i 3100w Inverter Generator with remote start.